Binaural Beats Concentration tracks are great for giving you that boost up into being on top mental form. When concentrating on a task is proving challenging, or you are wishing to develop stronger powers of focus then brainwave entrainment can really help you break through the obstacles you have been encountering. Whatever task you are doing the Beta brainwaves experienced during peak mental form will aid you in achieving better results. When your brain is truly firing at peak levels in terms of mental activity you experience the effects of Beta brainwaves. They are high energy and all mental activity becomes sharper. Your mind effectively gets "in the zone" and you become able to just fly with whatever you are doing. The issue for many people is distraction and background chatter which curbs their ability to get into the Beta state. This is when brainwave entrainment becomes incredibly useful of course. Granted there are other solutions, of which meditation is one of the best. The issue being that many other solutions take a certain amount of practice before you achieve any noticeable results. That said you can easily combine brainwave entrainment and binaural beats with the use of essential oils for concentration, and that is something which does bring even stronger results. In terms of a single solution though brainwave entrainment to beta brainwaves brings rapid benefit and the option for good long term benefits. Whilst you get an instant boost to your levels of focus there are long term benefits to using binaural beats too. As you use them on a regular basis your mind gets into a pattern, it builds an association which forms a trigger. Thereby enabling you to slip into powerful states of concentration whenever you need to. The more you use the tracks, though sticking to a maximum of 2 hours a day in total, the more your brain associates key things with your need to focus effectively and achieve good results. So using the tracks on a daily basis, certainly for the first 30 days helps you to build up a really strong mental resource. As with exercising your physical body, exercising your mind, flexing it and training it to perform in the way you wish it to builds it up to work more easily and efficiently in that way. Beta brainwaves induce a high energy state within the mind. They bring a more excited state and that can be highly beneficial. That state needs to be shaped and cultivated with care though. Without care a negative aspect can come out of it, as such time for relaxation and induction of greater positivity and calm is recommended. Also due to the higher energy and excited state of awareness brought by Beta it is recommended that time be taken to balance with relaxation time. For which either Alpha binaural beats or Theta binaural beats are recommended, though Delta binaural beats are also good, staying of course within the 2 hour per day recommended limit. So for whatever reason you need to improve your focus and concentration check out the binaural beats concentration tracks. Caution is advised against using dangerous machinery whilst using any binaural beats, other than that feel free to use them in safe and secure settings where you need an edge on your studies, work or other projects. 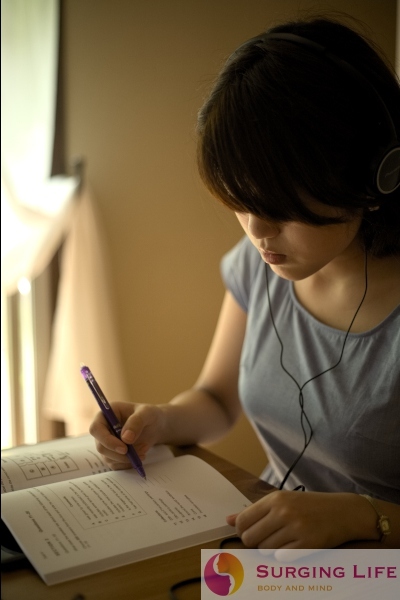 If you are seeking tracks to aid with study then check out the special "Super Learning - Music for Studying" soundtrack.